Yorkshire puddings are known the world over as the thing you have with roast beef. But making the prefect Yorkshire pudding can be a challenge because of the mythology and folklore that surrounds them. In a large bowl, mix the salt and flour together. Add the eggs, stir them in briefly, then add the milk and whisk until you have a smooth batter with no lumps. Leave to rest for at least 2 hours, but preferably overnight. Preheat your oven to 200°C (392°F) if it's a fan oven, 220°C (428°F) if it isn't. Metal muffin tins are best for making individual Yorkshires in. Add a little bit of fat to each tin and pop them in the oven to melt the fat. Folklore says the fat should be smoking when you add the batter, but actual research says it doesn't matter. Pour 2 tbsps batter into each tin. Pop the muffin tins in and bake until the puddings are well-risen and golden. In my oven, this takes 16 minutes, but remember, all ovens are different. Folklore saays you must not open the oven door during baking or your puddings will collapse. But actually, once they've risen as high as they're going to, it's okay to open the oven to turn them round if you want to. The video above is from the Keef Cooks YouTube channel. 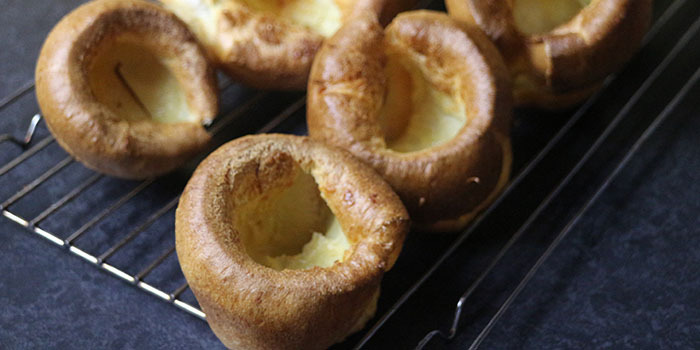 Click here to see the video recipe of Perfect Yorkshire Puddings on YouTube. Prep time: 5 minutes. Resting time: 2 hours. Total time: 2 hours 20 minutes.